All Flash Tools Collection v1.00 is a small application for windows computer created by GSM Ahad, which allows you to flash your smartphone and tablets. It includes multiple tools such as SP Flash Tool v5.1804, SP Flash Tool Old, SPD Upgrade Tool R19.0.0001, SPD Upgrade Tool Old, Odin3 v3.12.3 and Odin3 v1.70 Old. All Flash Tools Collection v1.00 also comes with multiple flash tool which helps you to quickly flash your android devices. 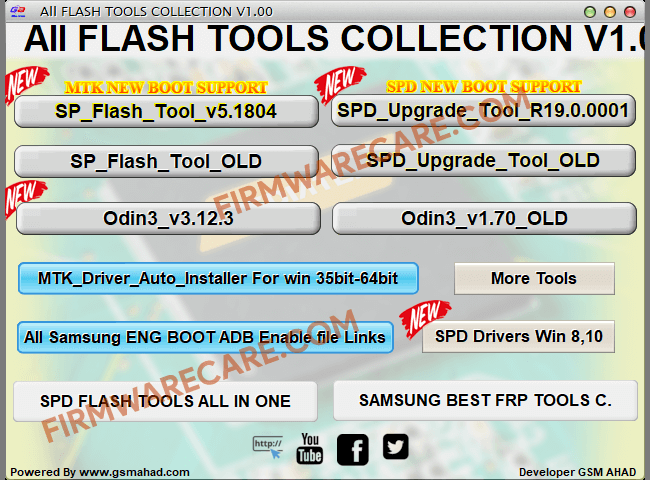 You can also install MTK and SPD drivers on windows using All Flash Tools Collection v1.00 in a click. It also includes All Samsung ENG boot ADB enable file links. In order to use the All Flash Tools Collection, you need to install the Universal ADB Driver on your computer. [*] Compatibility: The All Flash Tools Collection runs perfectly on Windows XP, Windows Vista, Windows 7, Windows 8, Windows 8.1 and Windows 10 (32 bit and 64 bit). [*] Credits: All Flash Tools Collection is created and distributed by GSM Ahad (developer). So, full credits goes to GSM Ahad (developer) for sharing the tool for free.